Among cities in California, Santa Barbara is considered a unique slice of paradise by natives and new residents alike. Year-round temperatures and weather are mild, warm and sunny. Santa Barbara and nearby communities of Isla Vista, Goleta, and Carpinteria are considered some of the most attractive for settling down; the area undoubtedly offers great school systems for families, safe neighborhoods, mild and sunny weather, world-class culture and fun nightlife, and plenty of outdoor recreational activities. This region enjoys a thriving and stable economy and is home to several industries. It is important to consider all aspects of moving to the Santa Barbara region before you relocate. 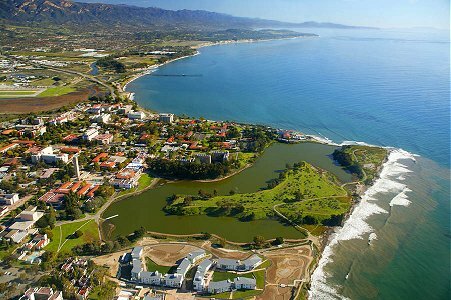 The 1,055-acre UC Santa Barbara campus is located on the Pacific Ocean about 100 miles northwest of Los Angeles. UCSB is located in an area of Santa Barbara (map) adjacent to the community of Isla Vista and the city of Goleta. Nearby cities in this region include (to the north) Buellton, Lompoc, and Solvang; and (to the south) Montecito, Carpinteria, and Summerland. About a half hour's drive south of this area is Ventura County and the cities of Ventura, Oxnard, and Camarillo. About an hour's drive north of this area is the city of Santa Maria. Highway 101 runs north/south through these coastal cities. Traffic is average, apart from typical morning and afternoon "rush hour" traffic in the metro thoroughfares of Highway 101, which makes the relatively short commute to campus an attractive feature of living in the Santa Barbara area. Santa Barbara is a coastal city nestled between the Pacific Ocean and the San Marcos Foothills, home of the Los Padres National Forest. Santa Barbara has a mediterranean climate with dry, warm summers and mild winters. The average daily temperature in Santa Barbara ranges from 60F to 75F year round. Rainfall is low to average during non-drought years, and snowfall is very rare. In the winter months, the average high is 60F and average low is 48F. In the summer months, the average high is 75F and the average low is 60F. See: US climate data for Santa Barbara. UC Santa Barbara is located on the Santa Barbara coast at the end of Highway 217, just a few miles from US Route (Highway) 101, a major freeway that runs north/south along the coastal counties of California. The campus and nearby communities are accessible from outside regions by highway/car, air travel, and train (Amtrak). The Santa Barbara Municipal Airport (SBA) is conveniently located about 1 mile from the UCSB campus and offers daily flights to major west coast airports. The nearest international airport is Los Angeles International Airport (LAX) and there are daily flights available from SBA to LAX. By car, travel from Santa Barbara to LAX is about 2 to 3 hours depending on traffic. There are several options available for travel by train or shuttle bus to LAX from the Santa Barbara area. The Santa Barbara Airbus offers several daily round trip shuttles to LAX. Santa Barbara MTD is the local bus services that offers several routes throughout Santa Barbara, to/from UCSB, and nearby towns. Santa Barbara County boasts a vibrant and diverse economy, home to numerous companies across the technology industry in particular. There is an active and well-connected community of professionals committed to technology start-ups and entrepreneurship overall. Several of these successful companies have found their roots in UCSB faculty and graduates. UCSB is a hotbed of research partnered with entrepreneurship, including the Technology Management Program, and hundreds of faculty in engineering and the sciences who have spun off their own industry ventures.